What are the experts concerned about? Reading the Quarterly Essay the other day has stirred in me many of the thoughts I came to when reading Stuart Brand’s Whole Earth Discipline a few months ago. One of the things that Brand mentions a lot in that book is the amount of fear that is generated by people that don’t actually know what they’re talking about. He specifically talks about how the environmental movement has scared people beyond the point where they can talk rationally about important issues, such as Nuclear Power and Genetically Modified Food. See the image below, which is a screenshot from my Kindle highlights. However, when you ask the experts about these options they’re not the ones that are scared. Nuclear experts the world over have spent lifetimes understanding nuclear power and have a good weighting of the risks involved. They’re not the ones that are concerned about nuclear power. Biologists are the same with regards to GMO foods. The people that know that most, are often the least concerned. Yet we continue to disregard their advice, because more of us share the same fears. We are sheep. A few days ago, I posted about how the presence of frogs in a wetland helps to show the health of that ecosystem. When I took that photo, I was on a walk on the property that hosted Railscamp. I took another photo that day, which I also thought I would share here. 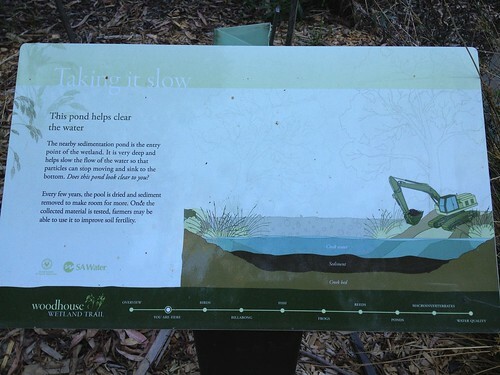 On this one, it outlined how a human made sedimentation pond was designed to slow the pace of the water flowing through the wetland and allow waste to drift out of the flow of the river system. It’s a natural way to capture the stuff that otherwise would add to the poor health of the ecosystem. Again, I couldn’t help but think about my own life and how this might offer some insight into the world we live in. I thought about but the flow of information. Especially, how information is currently moving towards a more stream based medium. Twitter, Facebook, Yammer and many other services have worked tirelessly to provide users a stream of content that they opt in for. In the same way as the pond, we need to remain cognizant that not everything in your stream is always going to add to the health of your own ecosystem. What matters most is your attention, and how you direct that. Having a social stream in your life helps with directing and spreading your attention greatly. But every so often, it’s still important to stop every now and then and assess what’s in your pond and how you can make that better. Doing so will add to the health of the overall system you’re a part of, and encourage better flow of information and knowledge. Dad posted me the latest Quarterly Essay this week and I had some time to sit down and read through it this afternoon. I don’t normally get a chance to read these, although enjoy it when I do. I like the dedicated nature of it, where one author gets to write a long essay on one particular topic. It’s a great concept. I should probably subscribe. Anyway, I digress. This quarters essay is by Andrew Charlton, who was the Senior Economic Advisor to the Prime Minister from 2008 to 2010. His time in that role saw him take in the infamous Copenhagen Summit held in 2009. That sets the scene for the essay, as he discusses why the approach of many developed nations to that summit was wrong and how that lead to the relative disappointment that stemmed from the inaction seen from it. The main contention of essay is that we’ve traditionally argued that we can either choose economic progress or preservation of the planet; but not both. Charlton walks through why this argument is basically flawed and also displays how many organisations; from right to left, continue to base their strategies and focus on winning this argument. Essentially, we will all lose if we continue thinking in this way. 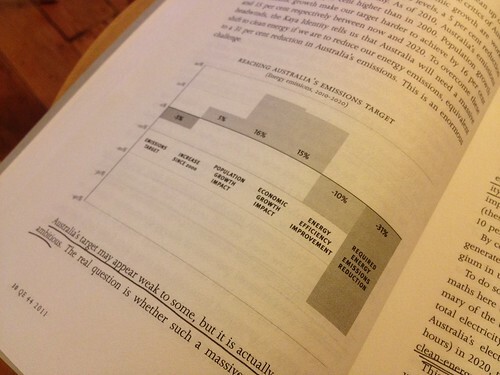 One thing I’ve taken from the essay was the following graph. I had never really engaged with what the 5% carbon emission reduction target that Australia has, except to think that 5% is not much. However, reading through Charlton’s thoughts, it becomes pretty obvious that it’s a huge task, which actually represents a target of reducing our carbon emissions by about 31% in real terms. Our population and energy use will continue to rise in the next 10 years, and so to see a 5% net reduction come into effect, we’ll need to reduce our total reductions by about 31%. Interesting stuff. 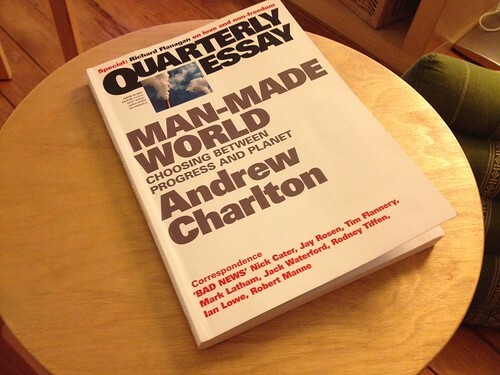 If you’re interested in the whole environmental movement and what’s happening, I’d recommend reading the essay. It’s very well balanced and takes a pragmatic approach, which I really like. Stuart Brands Whole Earth Discipline is similar in it’s message. If you can’t get your hands on the essay itself, theres a video with Charlton on SlowTV where he discusses the essay. I wanted to use this post to discuss the gaming industry a little bit and share some things that have become obvious as Kerry has continued to get better and better at playing. We’ve grown to understand the addiction that can come with playing ‘WoW’ and things like that, but the general punter probably hasn’t considered how much effort is required to push towards the top of the leaderboards in these games. Like anything, it takes discipline, effort and a lot of practice. You’d be pretty impressed. You’d also think immediately that this person you were chatting to was probably fairly intelligent and that they were a disciplined person. What I’m saying, is there’s not such a difference. Chess is well regarded, Starcraft and computer games in general, perhaps not so much. I believe we’re missing a very big opportunity here to celebrate people with very diverse, digital skill sets with this mindset. But following Kerry a little bit on his journey has opened my eyes to the various communities that exist on the internet to follow these sorts of games. Just last week, Kez had a game of his commentated and featured on this YouTube channel. The replay has so far had 145,327 viewers. That’s more than can sit in the MCG. Wow. I also used to work with Tom Stiller, a raid leader for a successful WoW guild. Tom was always happy to show me his world and walk me through how they selected and recruited guild members and how they trained and organised their missions. It was nothing short of a 20-30 hour per week job. The guild was about 15-20 people large, all contributing similar amounts of time. Jane McGonigal spoke at TED about gaming being able to save the world. With people like Kerry and Tom participating all over the world, developing the skills they’re picking up in these digital realms, I have no doubt that she’s right. Today, I spent the day co-working at Vibewire. I was pleasantly surprised, because when I got there it turned out that Omar Samad and co had organised a Jelly there. I love heading along Jelly’s that take place and have not really made a great habit of it since moving to Sydney a couple of years ago. 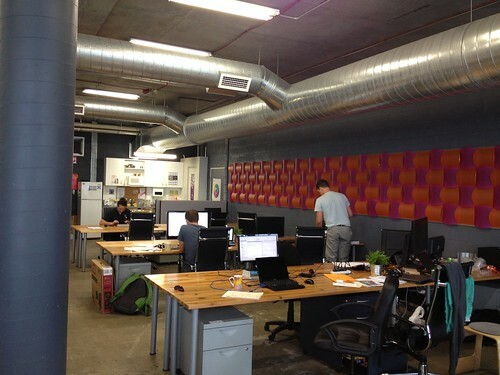 If you’re interested in co-working with some interesting a new people, I suggest you head along to the Vibewire Jelly. They run it on the first Friday of every month at their office in Ultimo. Thanks Omar, and thanks to Vibewire for opening their doors for Jelly!